Celebrate a gorgeous new baby girl in style with the Baby Blooms Girl. Frilly, feminine and bursting with traditional blooms, this boxed arrangement is classically beautiful and requires very little maintenance. 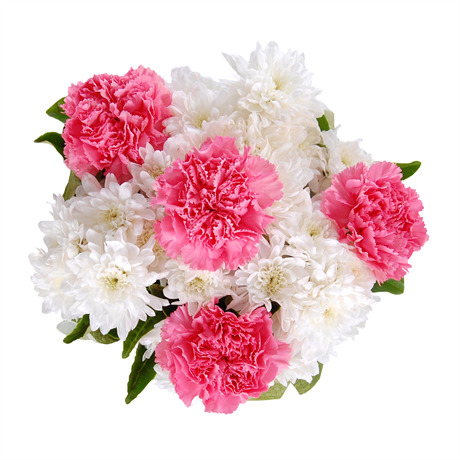 The delicate lace of snowy white chrysanthemums contrasts beautifully with the frilly feel of ballerina pink carnations, and is completed with a beribboned gift box and adorable teddy bear. This hospital-friendly boxed arrangement does not require arranging in a vase, and is a cost effective floral centrepiece that looks a million dollars. Support new parents with a gift that expresses your congratulations and joy about the newest addition to the family.